Are you planning a birthday party, anniversary dinner of a simple get-together or friends, family or colleagues? At Bartellas we have menus to fit all occasions, tastes and budgets. Speak with the Restaurant Manager so that we can discuss your requirements, personalise menus, arrange seating plans and suggest some extra touches to make your event special. We can now offer the Orangery and the Salon for private dining (minimum party size for the Salon is 16 guests). Where access to The Salon on the first floor is an issue, for parties of between 14 and 20 people who wish to sit and be served at the one table we can offer a combination of two large round tables joined together, in the corner of the ground floor restaurant over by the French doors. Effectively you have your semi-private space but still with the buzz of the restaurant. 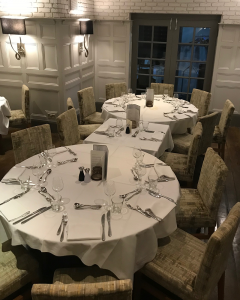 We would then devise a bespoke table d’hote menu for the group and occasion: a choice of starters, mains and desserts, ordered once seated and at a price to suit your budget. See the current party menu and contact us on 01474 812154 to book or for more information.